I am a very savvy shopper and always try and get the best deal. NOW... I'm not trying to be cheap, I'm just trying to save some money here and there when I can. I LOVE CVS for this reason, the more you shop there the more coupons and Extracare bucks they give you. 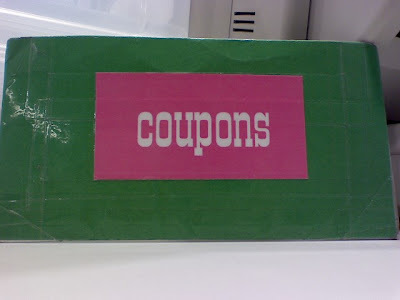 Just cut up a simple file folder (mine is green because its so much more interesting than the plain tan color those file folders come in), slap on a homemade "coupon" sticker, and tape the crap out of it with some clear packing tape and ta-da...a chic coupon organizer.